Tobie watches a bunch of movies without me and from time to time he recommends some of them for me in turn. Sicario was one of those movies but the title just seemed so alien to me and thus I never got around to it. To be fair, it wasn't a high priority thing to watch either - just something that he felt was worth watching should I find the time for it. And so it was on another flight between home and Singapore that I was fortunate enough to encounter it in the plane's in-flight movie library along with the sequel that this movie had apparently merited. I needed to kill time with something and I wasn't too keen on watching a newer movie without Tobie around so this is the route I took. The movie was surprisingly intense and the main limitation for me was how clear my airplane monitor was as it certainly blurred out some of the finer details of some of the scenes. Still, the movie made for an interesting narrative to get lost in for this particular journey. Synopsis: Sicario is a 2015 American crime thriller movie directed by Denis Villeneuve. The screenplay had been written by Taylor Sheridan and the movie as a whole was nominated for a good number of awards. The story begins with FBI agents Kate Macer (Emily Blunt) and Reggie Wayne (Daniel Kaluuya) raiding a Mexican cartel safehouse only to find dozens of corpses secreted into the walls of the structure. Subsequently Kate is recommended for a Department of Justice special joint task force to apprehend a lieutenant of the Sonora Cartel, one Manuel Diaz (Bernardo Saracino). Given this links to her case with the dead bodies in the safe house, she agrees to join the effort to apprehend Diaz. The operation is largely under the command of Matt Graver (Josh Brolin) with the rather enigmatic Alejandro Gillick (Benicio del Toro) acting as his one down in all this. As they journey south to Ciudad Juárez, Mexico to extradite Diaz's brother, the task force repeatedly demonstrates a lack of respect for local law enforcement or even the basic principles of legality in pursuit of their objectives, which makes Kate increasingly uncomfortable with how the taskforce is handled. What I Liked: You can feel the very measured and deliberate way this story is crafted with every scene which lends credit to the movie as a whole. The story at play here is a rich one where it's not entirely clear who are the "good guys" and the "bad guys" and how it paints these shades of gray is what really drives the movie. Emily Blunt has really come a long way from her earlier movies and handles herself very well in this venture. She's a very strong and emotionally complex character and one who makes for a great protagonist in what is often a morally murky movie. But she's not exactly 100% angelic or something and she doesn't get out of this experience without any blood on her own hands, which is what helps paint this story as being painfully real. What Could Have Been Better: I can't agree with every directorial decision in this movie as there was a fair about of jumping about that didn't necessarily feel necessary. This particularly notable with the character of Silvio (Maximiliano Hernández) who we keep going back to throughout the movie only for him to play a rather minor role in the events leading up to the movie's climax. After that I just felt like I'm not sure what they wanted to happen here since it felt like going to rather extreme lengths just to humanize him further or something. The movie also starts out a bit rough and the full nature of the task force isn't immediately clear even once the mission was underway. I know this could be partly related to the fact that I had watched it on a grainy airplane screen, but I think the movie could have done more to setup elements of the story better without resorting to spoon feeding the plot wholesale. 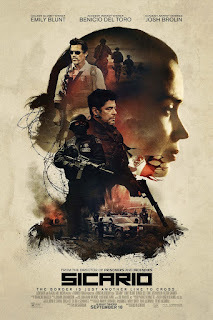 TL;DR: Sicario is one of those movies that leaves you wondering why the world is the way it is since the gray side to things isn't the easiest to accept. But the willingness to venture into this darkness is what makes the movie so striking. And thus it gets a good 4 surprise killings in the name of some brand of justice out of a possible 5.